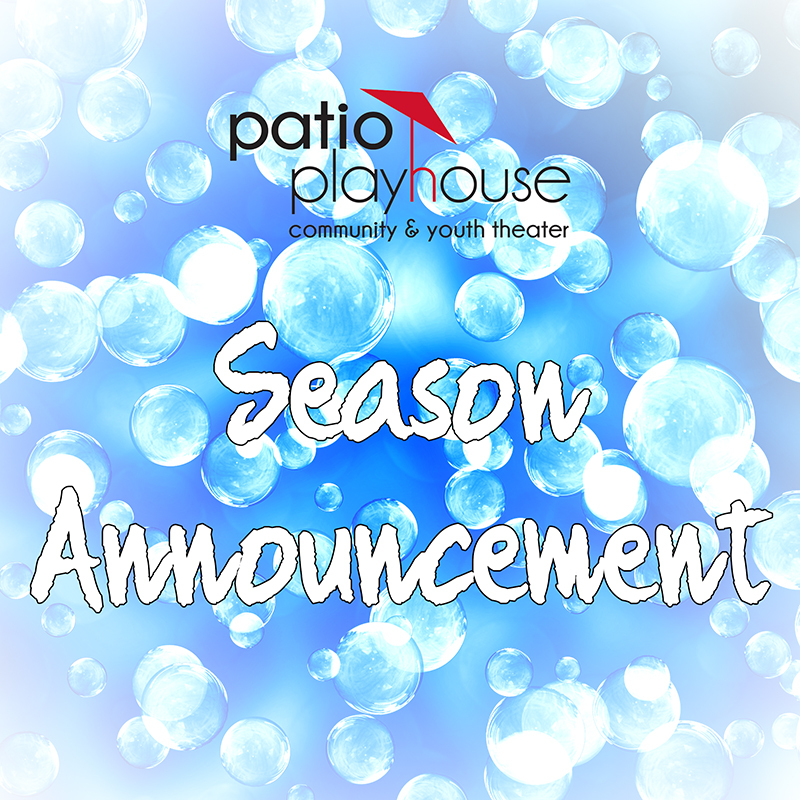 It is my absolute pleasure to announce Patio Playhouse’s 53rd season! Patio Playhouse has provided high-quality, affordable shows to North County for over 50 years and is excited to continue to share this wonderful art with our community. Last year, we produced a world-premiere musical in “Quibbling Siblings,” brought Spanish playwright Juan Mayorga’s work across the ocean with the US-premiere of “Animales Nocturnos” performed in both the native Spanish and English, and brought three high quality musicals to Kit Carson Amphitheater with our Plays in the Park series. It is my personal belief that theater, more than any other art, is a reflection of the times. I believe that, as theater-makers, it is our duty to hold up the proverbial mirror to the world and help it become a better place for everyone. As I began contemplating this coming season, one thing I kept returning to was how few playwrights seemed to be women, and how much I enjoyed the work of the women playwrights I had read. I made it my mission to read as many shows by female playwrights as I could. I found this quest invigorating and instructional, and I also managed to find a number of fantastic shows that we are excited to share with you. All of our adult-season productions this year will feature women playwrights. We will begin our year at Kit Carson Amphitheater with a special performance, “Symphonic Broadway – A Celebration in Dance.” We’re partnering with Visionary Dance Theatre and Kidz Danz Kompany to bring you a dance concert celebrating the symphonic works of Broadway’s biggest composers. In July, our Youth Theater will produce the Royal Shakespeare Company’s version of “The Wizard of Oz.” This stage version holds true to the beloved classic MGM film from 1939. We finish our Plays in the Park series at Kit Carson Amphitheater with “Little Women, The Musical.” This adaptation of Louisa May Alcott’s classic novel of the same name is filled with personal discovery, heartache, hope and everlasting love. In September, we move back to our theater on Grand Avenue in Escondido to bring you Sarah Ruhl’s “Dead Man’s Cell Phone.” This Helen Hayes Award-winning show “explores the paradox of modern technology’s ability to both unite and isolate people in the digital age.” We follow that in October with another adaptation of a classic novel, “Sense and Sensibility.” This playful adaptation by Kate Hamill is a madcap romp through the fortunes and misfortunes of the Dashwood sisters, Elinor and Marianne. Over the holiday season we will be sharing the story of both Chanukah, the Jewish Festival of Lights, and the Posada, the story of Mary and Joseph looking for a safe place to stay in Bethlehem. We will celebrate these stories and this happy time of year with songs and carols. In March, our youth theater will be performing 2 one-act plays by local playwrights, Neil Pisk and Shari Lyon. These wonderful stories, suited for all ages, will be a wonderful chance for our young actors to experience working with new works and local playwrights. But featuring the work of these playwrights wasn’t enough. I also wanted to ensure that we were providing opportunities to women in our community. All of these shows feature prominent female characters and many of them have a majority female cast and I’ve sought to ensure representation at the production level as well; to that end, we will have women in prominent roles (director, producer, and/or music director) for every production this season. I truly cannot wait to share these stories, this art, and these characters with our community. Patio Playhouse is reaching new heights artistically, creatively, financially, and civically. We are grateful to be a part of this wonderful community and elated to be able to continue to be able to bring you this amazing art.